I will call this a “row-of-boxes” diagram. In my experience, this type of diagram is common in both CNN papers and CNN lessons, even though the audiences are very different in those two contexts. I would argue that row-of-boxes diagrams are targeted at people who already understand CNNs, not students seeing them for the first time. Given the diagram issue and other obstacles, it took me a few iterations to fully understand CNNs when I was a student. 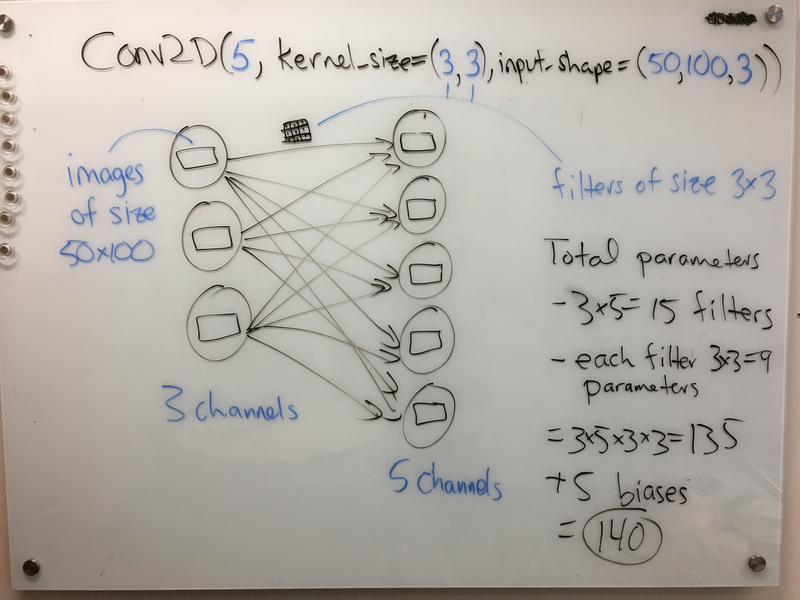 In this post, I will describe my approach for teaching CNNs here in the UBC MDS program, which I am hoping is more clear. A Jupyter notebook implementation of my lesson can be found here. My approach comprises three main principles for teaching CNNs: using circle-and-arrow diagrams, focussing on the shape of the data, and teaching 1D convnets before 2D and beyond. The post is structured around these three ideas. Note that while this post is about teaching CNNs to those who are new to the subject, this post itself presumes familiarity with CNNs. In the above diagram, one can read off the number of learnable parameters in the layer: 10 arrows, at 3 parameters each, yields 30 params; then, add the 5 biases (one per output circle, just like the fully-connected case) for a total of 35. A small tangent: when teaching, I like to emphasize that the number of parameters (of this layer) does not depend on the sequence length, which is 100 in this case. This is a big win for CNNs vs. fully-connected nets: by taking advantage of the structure of the data we limit the number of parameters, thus effectively incorporating our prior knowledge. Again, one can read off the number of parameters from the diagram with relative ease; see the right-hand side of the figure. I like these diagrams for several reasons. First off, students are already used to these types of diagrams from learning about fully-connected networks. The main difference here is that the base operation has changed from multiplication to convolution. Everything else stays the same: add up the results from each of the arrows to get the result in an output node; apply a bias and a nonlinear activation at each output node; the circles contain hidden representations and the arrows contain learnable parameters; etc. Second, I like these diagrams because they work equally well for the 1D and 2D case, thus creating a framework for illustrating convnets of various types. Contrast this with the row-of-boxes diagram above, which is more specific to 2D. The diagram also clearly differentiates between the hidden representations (circles) and parameters (arrows), unlike the row-of-boxes diagram, which draws them both as boxes. Another small tangent: a former student pointed out that these circle-and-arrow diagrams are really showing the computational graph of the layer, in which the circles are variables and the arrows/edges are computations. Computational graphs are increasingly prevalent in machine learning, for example in the contexts of automatic differentiation and probabilistic programming. In the discussion, I emphasize that the shape of one training example has gone from a vector (as in the standard supervised learning setup) to a 2D array. In other words, I would say in class, the 2D array above is just one training example, not the entire data set. I believe discussing the data’s shape in this way is very powerful when teaching CNNs. If you look through the notebook, you’ll see a slow progression: first, applying a single convolutional layer with one feature, then multiple features, then multiple training examples, then multiple layers, and finally the idea of flattening the hidden representation before applying a fully-connected layer at the end. For each case, we carefully examine the shape of the hidden representation and also the shape of the weights, identifying the meaning of the different dimensions in any multidimensional array. For example, with a 1D convolutional layer, the hidden representations are 3D arrays (number of examples by length of sequence by number of features) and the weights are also 3D arrays (length of filters by number of input channels by number of output channels). Returning to the data table above, I also emphasize that the two dimensions are not interchangeable: the rows constitute an ordered or structured dimension, whereas the columns are an unordered set of features. This helps students establish a framework for thinking about the multidimensional arrays. It also helps explain why a 1D convnet has 2D training examples, a 2D convnet has 3D training examples, etc. A note on the word “dimension”: this is highly confusing word, because it can mean the number of axes of an array, or the number of elements in a vector; here, I am using the former meaning. See the “dimension vs. size vs. length (of a vector)” entry of our terminology document for more info. As far as I can tell, 2D convnets are the most canonical and popular CNN type (by “2D” I mean that each feature is a 2D signal, i.e., an image). Perhaps because of their popularity, 2D convnets are often at the forefront of CNN lessons; indeed, the row-of-boxes diagram above represents a 2D convnet. However, I find that 1D convnets are much easier to teach and understand. Therefore, I start by teaching 1D convnets before moving on to the 2D case. 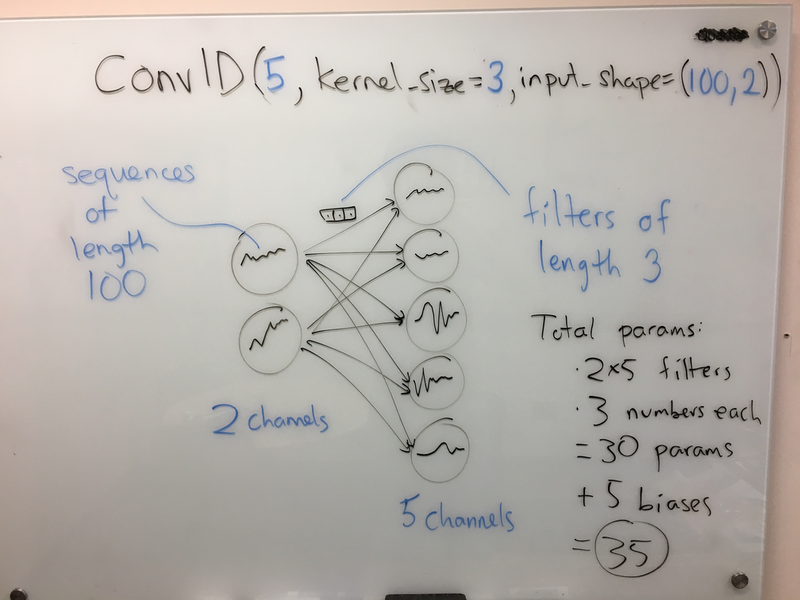 Consider using a 2D convnet for image classification. For each of the following changes to your data set, do you expect the test error would increase, decrease, or stay the same? Assume the transformation is applied before training and that the same transformation is applied to both train and test. Shuffle the channels of your images. For example, if you had 3 colour channels for red/green/blue, then consider rearranging them to blue/red/green. Shuffle the rows of your images. For example, the top row of your images now becomes the 7th row, and the 7th row becomes the 12th row, etc. The three points above summarize my main ideas about teaching CNNs. I also have developed some smaller strategies, like setting the convolution behaviour such that the inputs and outputs are the same size, which eliminates an extra potential source of confusion. If you’re interested, you can check out this and more in my lecture notebook. So far I have given this lecture twice, and it seems to have been effective. Perhaps someone will find it useful! Mike Gelbart is Option Co-Director of the MDS Vancouver program and an Instructor in the UBC Department of Computer Science.